Titan Recreation is a part of Associated Students Inc. (ASI) and promotes the belief that fitness should be for all – no matter your size, shape, fitness level, or physical ability. Collegerank.net named the Student Recreation Center (SRC) one of the 35 most luxurious student recreation centers in the United States. With everything from an indoor rock wall to a martial arts studio, the SRC has something for everyone. Our mission is to provide innovative and inclusive recreational opportunities to inspire the development and well-being of the student and campus community. Our vision is impactful participation in recreation by all. Three separate courts with curtain dividers and scoreboards. To reserve a space, please complete and submit the Titan Recreation Facility Request Form. The following represents the fall hours for the Student Recreation Center. These hours are subject to change and holiday hours may vary. If you are a currently enrolled CSUF student, you can sign up for a membership at no charge. Non-enrolled students, CSUF Faculty and Staff, Associates, and Affiliates have various membership options available. Visit the customer service desk on the first floor of the SRC and activate your membership today! Be sure to bring your Campus Wide ID (CWID), a photo ID, and payment information. Activate your membership now by visiting the Titan Recreation portal page. Registered CSUF alumni, retired/emeritus faculty/staff, university auxiliary staff, visiting faculty, and students enrolled through the university’s Extended Education program. Spouses/domestic partners, parents, adult children and adult siblings of an eligible student or associate member; members of the Osher Lifelong Learning Institute (OLLI); students, faculty and staff of Hope International University and Marshall B. Ketchum University. One-day guest passes are valid for 24 hours after purchase for access into the Student Recreation Center. One-day guest passes are not memberships and some restrictions apply. Limit 2 guests per member per visit. Members must be with their guests at all times. Guests must bring ID with them every time they enter the facility. Sign up for towel service. If you are interested in cancelling your membership, requesting any type of refund, or transferring from one instructional class to another, please complete the Titan Recreation cancel/transfer/refund form. Members and guest pass holders have the ability to check out equipment from the first floor front desk. 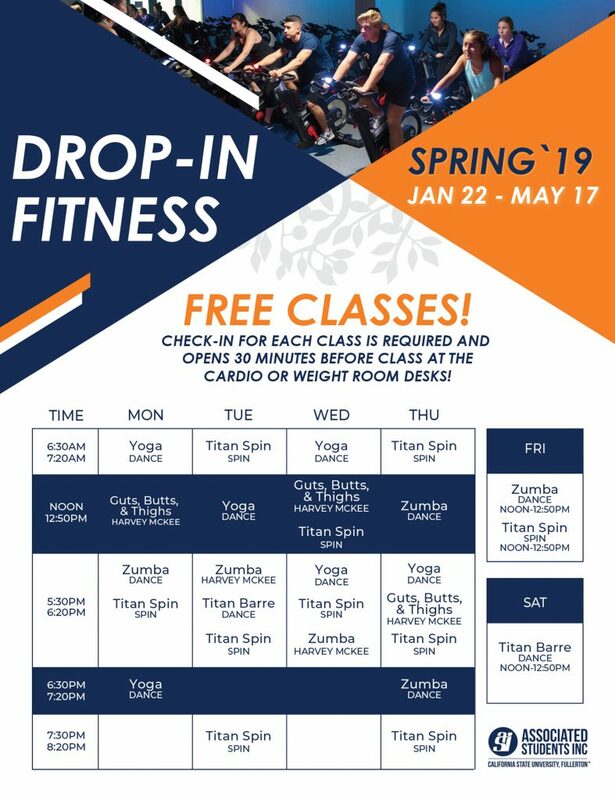 Titan Recreation Drop-In Fitness classes allow members to develop and expand skills related to the latest group exercise trends. Available at various times throughout the day, these classes provide a complete workout for both the novice and experienced individual. All classes adhere to the rudiments of proper technique and choreography associated with contemporary exercise programs. 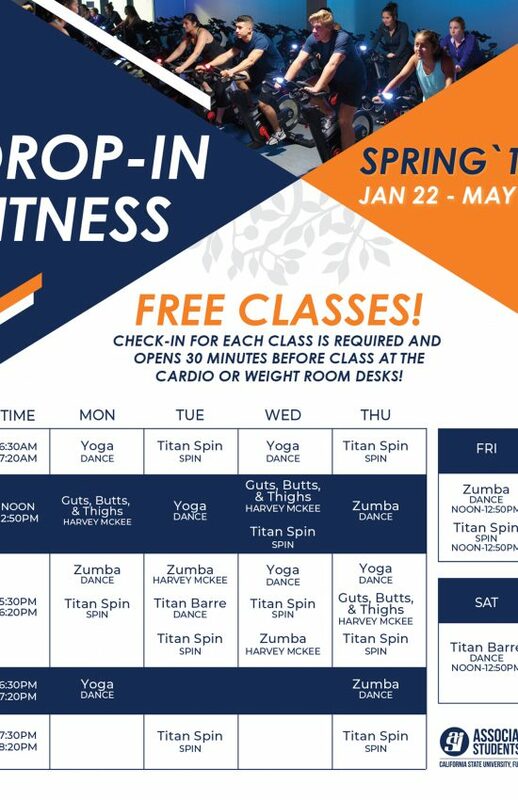 Drop-In Fitness is FREE to CSUF students & Student Recreation Center members. Target your core, glutes, and legs through a series of cardio and strength training exercise that will keep your heart rating going. Join this class for a fast-paced and diverse workout. Sculpt your abs and strengthen your core with this 30 minute ab circuit! Challenge yourself through a vigorous workout that minimizes rest time to ensure the greatest gains, introduce yourself to new exercises, and learn proper form for ab exercises. All fitness levels are welcome. Titan Barre combines elements of pilates, ballet, yoga, and dance to develop flexibility, strength, and tone. Enjoy a vigorous, but non-impact, cardio workout. Learn proper set-up, riding technique, proper form, moves, and safety techniques. This class is great for all cyclists. Focus on the mind-body benefits of Yoga with this intense class. Improve your overall conditioning, balance, flexibility and strength with this vigorous format. All levels welcome! Zumba is a fusion of Latin and International music that creates a dynamic, fun, and effective fitness routine. Achieve long-term benefits in this exciting hour of calorie-burning dance based class! Want to start lifting weights but don’t know what to do? Let us help you navigate through the newly renovated weight room and teach you the basics of resistance training. Our certified personal trainers will lead you through a 60-minute weight room orientation including a comprehensive tour, proper equipment set-up and form, and a full-body training plan. Titan Recreation offers a variety of dance, martial arts, Red Cross, and swim classes that aim to teach skills and techniques to new and experienced participants. Classes are taught by professionals who utilize the current industry trends, choreographies, and techniques. Two six-week sessions are offered every semester at various times throughout the week. 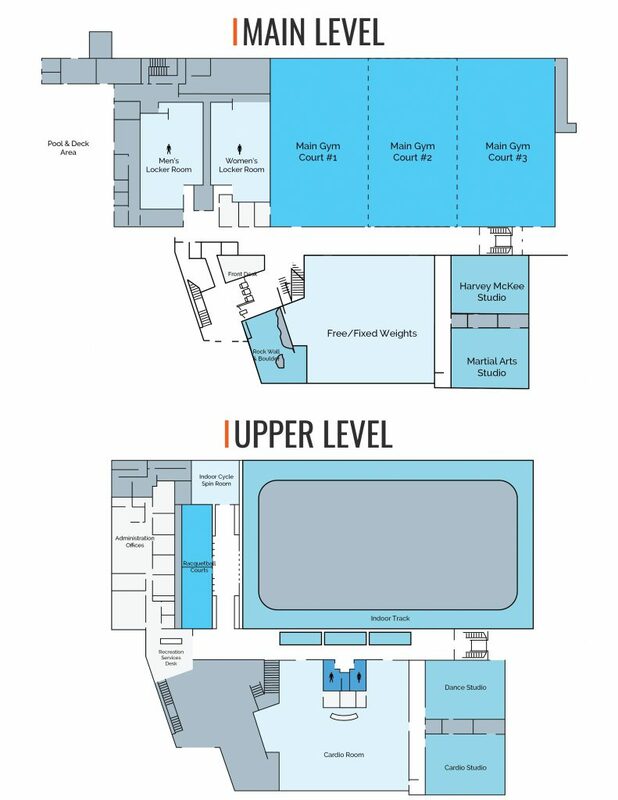 Instructional classes are available to CSUF students, Student Recreation Center members, and non-members. Learn how to move your body in a gracious manner! No previous dance experience is necessary and both men and women are welcome. Beginner and intermediate ballet classes are offered. Learn core abdominal movements, body undulations, and dance steps to drum beats and international music. We will strengthen and stretch your abs, legs, and arms to move gracefully and powerful. No experience required! You will learn dynamic belly dancing choreography, practice drills, and utilize multiple dance movements harmoniously. Students will utilize layering, speed, and dramatization of movements to create a masterful performance. Suggested for those who have taken the beginner class or have previous belly dancing experience. Learn various styles of Hip Hop choreography in a beginner friendly environment. No dance experience necessary! Hip Hop Intermediate: For those with some hip hop dancing experience, engage in more complex choreographies with our experienced instructor! You will learn at a quicker pace and have the ability to perfect and refine your dancing style of the urban movement. Incorporating many styles of hip hop, you will learn new techniques to boost your confidence on the dance floor. This class is a great way to work on your technique in jazz dance. We will work on flexibility, turns, leaps, kicks and much more while dancing with a fun and energetic style. Join this class and get a whole body work out while also learning new moves and having fun in the process. Intermediate class focuses on more advanced turns and leaps, prior experience is recommended. One of the hottest Latin dances has become a great workout alternative. This class will teach the many steps of Salsa dancing and techniques while leading/following a dance partner. Dance partner not required to participate. This class is for experienced Salsa dancers and will take your dancing to the next level! Dance partners will be assigned so that you can work with the same partner to further develop your style and skills. Approval from instructor will be needed to join this class. Do you want additional training and expertise in the SRC? Schedule a personal training session today. Each one-on-one or buddy appointment is conducted by a certified personal trainer. Our trainers will assist you in meeting your fitness goals and needs. This class is designed to improve swim strokes, endurance, and swimming performance. It is a great class for those interested in improving swim times for triathlons and other swim events, or just to swim for fitness. Class is held on Wednesday night. Get ready to increase your flexibility, strength, and cardiovascular endurance while learning practical self-defense skills. This class will allow you to learn techniques in kickboxing to help develop your coordination and timing while being motivated to reach your fitness goals! Gi Jiu-Jitsu is very similar to Brazilian Jiu-Jitsu with the use of the traditional gi. You will learn a series of techniquessuch as submissions, throws, sweeps, guard passes, and reversals to control your target without the use of punches. The class is targeted for those with martial arts backgrounds and for those who wish to compete. Jiu-Jitsu Fundamentals is for participants with no or little experience. You will learn basic movements and techniques of Jiu-Jitsu in a non-threatening environment. The class focuses on the core concepts of body positioning while mastering critical attacking and defending techniques of Jiu-Jitsu. Students will learn how to check a conscious and unresponsive person and how to administer care. Students will learn CPR compressions, rescue breaths, and the use of an AED. Students will also learn how to assess if a person is choking and techniques to remove chocking hazard. Students will receive certification in Adult and Pediatric CPR/AED which is valid for 2 years. Students will learn how to check both conscious and unresponsive adults, children, and infants, and how to administer care. Students will learn CPR compressions, rescue breaths, and the use of an AED. Students will also learn how to assess if a person is choking and techniques to remove chocking hazard. Students will learn standard first aid care for sudden illness and injury. Students will receive certification in Adult & Pediatric CPR/AED/First Aid which is valid for 2 years. The Red Cross program offers the opportunity to become a certified swim instructor through its Water Safety Instructor (WSI) course. The course is 32 hours long, meeting for two Saturdays and two Sundays. Participants must be 17 years old to register. The Red Cross Lifeguard course will instruct students on the various lifesaving techniques, extrications, and rescues required to be certified in shallow and deep water pools. CPR and first aid for the professional rescuer are included in the course. Students will be provided a CPR mask. The student must attend all 3 classes and pass the pre-requisites: 300 yd swim; 5 pound brick retrieval from deep water; tread water for 2 minutes; and jumping from a height into deep water. The student must pass all sections in order to receive certification. Certification is good for two years. Intramural Sports offers opportunities to participate in sports activities on a competitive or recreational level. Sport leagues and tournaments are available in a wide variety of indoor and outdoor sports year round. All Intramural events are open to currently enrolled CSUF students, alumni, faculty, and staff. League registrations are processed on a first come, first served basis. A representative from each team must attend the Captains’ meeting. Teams without a representative at the Captains’ meeting risk being dropped form the league. Individuals who have not yet found a team or partner can sign up as a free agent at the SRC front desk and attend the league’s free agent meeting. To view current leagues, schedules, and to register please visit the IM Leagues webpage. Please visit our IMLeagues website for specific league information and deadlines. Titan Outdoors is your new gateway to life not only outside the classroom but outside of any building! If you love hiking, climbing, beaching, paddling, or anything outside, take a Titan Outdoors trip! Join a small group of other students as we travel around the west and experience everything the Golden State has to offer! No experience is needed to join an expedition. No matter if you are a newer adventurer or a seasoned explorer, Titan Outdoors offers a wide variety of trips. We provide transportation, trip leaders, and gear on all of our excursions. See below for this semester’s trips and sign into your Titan Recreation Portal to register for trips and clinics! Join Titan Outdoors on our first ever trip, as we hike to the iconic Hollywood sign! This fun hike is about 6 miles and offers great views of L.A. and detours to see famous movie locations, as well. The Mt. Zion and Sturtevant Falls hike offers some excellent hiking close to campus. Come with Titan Outdoors, as we hike this moderate-level 7-mile hike. Expect some elevation changes while viewing some wonderful views from the mountain top as well as some unique canyon and scenes. We will finish the trail off with a nice foot soak at the base of Sturtevant falls. Enjoy a day in South Orange County as we hike Crystal Cove and explore the tide pools. This state park offers over 15 miles of trails, as well as 3 miles of coastline to enjoy. The morning will be spent on the trails and the back country of the park and then we will enjoy the tidepools and marine wildlife of this diverse state park. February 28 |Â 4:00-6:00 p.m. In California, we have almost 15 million acres of protected wilderness, recreational, and historic sites for us to enjoy. Appreciating this land is all of our right, but we also have a responsibility to preserve and protect this land at the same time.Â Join this clinic to learn the 7 principles of leave-no-trace and how you can take steps to recreate responsibly in dynamic and fragile ecological environments without negatively effecting the land. This 16-hour course is perfect for outdoor enthusiasts, recreation participants, or those who work in the back country setting for research or any other purposes. We will cover advanced skills to be used in emergencies when help from professional first responders may be far away. Be prepared for hands-on practical training in a variety of topics. The Student Recreation Center features an indoor climbing wall that is suitable for climbers of all skill levels. The rock wall is a showcase element, located in a highly visible space within the facility. The 1,100 square foot wall is utilized for bouldering, top rope, and lead climbing. It is 30′ high and 27′ wide and accommodates 8 top rope stations. A Test Out option is available for experienced climbers who know how to do all the safety skills necessary to climb and belay. Our expectation is that this climber has been taught well and climbed for many months or years and doesnt need the course. We have high standards, so if it has been a while since you climbed, you may want to take our course to refresh your skills. A beginning class designed to teach the new climber all the safety skills needed to pass the Rock Wall Belay test. This two-hour class includes all equipment and gives you the skills required for access to the Rock Wall during Open Climb. Belay Test-Out included in class price. This class is offered on a regularly scheduled basis and by appointment. This intermediate class is designed to teach competent climbers and belayers the ins and outs of lead climbing! This fun form of climbing opens up the world of outdoor climbing. This two hour class covers all the equipment needed and gives time to cover climbing basics and belaying technique for lead climbing. This class will cover advanced climbing techniques to take climbing from the gym to the crag. Topics of discussion will be equipment needed, advanced belaying techniques, local climbing crags, and logistics for a fun day of outdoor climbing! The rock wall always has something going on! We host monthly crate stacking, slacklining , and neon nights as well as a variety of special events throughout the semester like our climbing challenge, monsters on the wall, climbing competitions and more! Keep your eye out on @titanrecreation social media for upcoming events! A For information about routes and ratings at our rock wall please click the link below. Our routes are updated frequently so check back often and have fun climbing! Learn to Swim promotes a safe and fun swim environment where children feel comfortable learning and developing their water skills. Lessons are available for ages 6 months and up. Titan Recreation swim instructors have Water Safety Instruction (W.S.I.) certifications or lifeguard certification and a comparable level of training and instructional experience. While we make every effort to preserve instructor continuity, we cannot guarantee it. For children aged 6 months through 3 years. Children must wear swim diapers. Skills include: blowing bubbles, kicking, holding onto the wall, floating on front and back, and water safety skills. Offered weekdays at 10:30AM and 5:30PM. For children ages 3-4 years (preschool). Skills include: bobbing, kicking, exhaling under water through mouth and nose, floating on front and back, and introduction to arm strokes. 28 minute classes offered weekdays between 9:30AM-11:30AM and 4PM-6PM. Offered Saturdays at 10AM, 10:40AM, 12:40PM, and 1:20PM. For beginners, ages 5 years and up. Skills include: water adjustment, bobbing, blowing bubbles, kicking, floating on front and back, gliding, and combined leg and arm actions on front. 28 minute classes offered weekdays at 9AM, 9:30AM, 10:30AM, 11:30AM, 4PM, 4:30PM, 5:30PM, 6PM, and 6:30PM. Offered Saturdays at 11:20AM, 12:40PM, and 1:20PM. Must have passed Level 1 or aged out and passed Tiny Tots. Skills include: floating on front and back, gliding, combined leg and arm actions on front and back. 28 minute classes offered weekdays at 9:00AM, 9:30AM, 10:00AM, 10:30AM, 11:30AM, 4:00PM, 4:30PM, 5:00PM, 5:30PM, 6:00PM, and 6:30PM. Offered Saturdays at 10:00AM, 10:40AM, and 12:40PM. Skills include: front crawl, backstroke, side breathing, and elementary backstroke. 28 minute classes offered weekdays at 9AM, 10:30AM, 11AM, 5PM, 6PM, 6:30PM, and 7PM. Offered Saturdays at 10:00AM, 11:20AM, and 1:20PM. Skills include: front crawl, backstroke, elementary backstroke, breaststroke, butterfly, and sidestroke. 28 minute classes offered weekdays at 10:00AM, 11:00AM, 4:00PM, 5:00PM, 6:00PM, and 7:00PM. Offered Saturdays at 10:40AM and 12:00PM. Skills include: endurance front crawl, backstroke, elementary backstroke, breaststroke, butterfly, and sidestroke and front flip turns. 28 minute classes offered weekdays at 9:30AM, 5:30PM, and 7:00PM. Skills include: endurance, front crawl, breaststroke, sidestroke, lifesaving skills, using a buoy, survival swimming, turning in the water, treading water, and retrieving objects from deep water. 40 minute classes offered Monday – Thursday at 7:00PM. Skills include: submerging face, moving in chest deep water, bobbing, floating, rotary breathing, flutter kicks, and more. 28 minute classes offered weekdays at 11:30AM and 6:30PM. Offered Saturdays at at 11:20AM. Download the Learn to Swim Brochure. Registration opens April 1st. Registration can be completed in-person at the Student Recreation Center or online using the link below. â€¢ Must be 16 years or older and must attend all three classes. Specializing in various recreation & sport-related activities, Titan Youth Summer Camp (TYSC) offers nine fun-filled weeks for children ages 4-12 years old. Activities are rotated daily and include bowling, rock climbing, soccer, flag football, martial arts, hockey, Zumba, volleyball, outdoor adventure, track & field, arts & crafts, movies, dress up Fridays, and more! Titan Youth Sports Camp (TYSC) runs from June 11th – August 10th and is offered in both half and full day formats. We also offer pre-care beginning at 7:30AM and post-care until 6:30PM. CSUF students, faculty, and staff receive a 20% discount. Parent orientations are offered during the following dates/times. Download the Titan Youth Summer Camp FAQs. Do you have a question about the Student Recreation Center or Titan Recreation? Feel free to give us a call, send us a direct email, or contact us via social media.